When the attack began on Pearl Harbor, Doris Miller was not carrying an elegant tea service as in the movie. He was carrying laundry. The Zeros in the movie aren’t the right model. The ones in the film are A6M5 Zeros which came out later in the war. The ones used at Pearl Harbor were the A6M2’s. One of the intelligence photos shown to the Japanese preparing for the attack on Pearl Harbor shows a North Carolina class battleship which wasn’t in Pearl Harbor at the time. Of course the dramatic two-plane resistance piloted by Rafe and Johnny is inaccurate. In reality six planes reached the air and fought the Zeros. The Zeros on the Japanese aircraft carrier are lined up backwards and the island changes position from shot to shot. In one wide shot of Pearl Harbor you can see the Arizona Memorial. This is not only a failure of history, but also Hollywood. What kind of self-respecting director let’s that slip by? A Japanese Naval officer says in the movie “We have hit battleship row. Now we must hit the smaller airfields.” Actually the attack was planned so that all the targets were hit simultaneously. The movie changed this to give Rafe and Danny more time to get to the airfield. 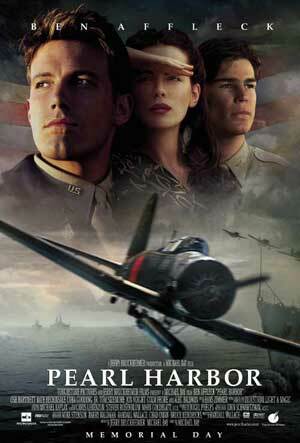 The P-40’s used in the movie were later models than the ones used at Pearl Harbor in ’41. When the Japanese planes fly over a low hill towards the harbor to bomb it, a cross is visible on the hill. That cross was not there in 1941, but was placed there as a memorial to the point where the enemy planes first came over the hill. When the Zeros fly through a valley to reach Pearl Harbor, they are actually headed away from the harbor. The spinning fans on the bombs weren’t the actual fuses, they were meant to arm the fuse so that the bomb would detonate on impact. Therefore the bomb that landed intact on the airfield should’ve blown up, not bounced. It also should’ve suffered some damage in the fall, but it is completely intact. When the USS Arizona is sinking down sideways, water pours down the deck. This is impossible. This is definitely very Hollywood: the nurses wear a ton of makeup. However, this was (and still is) against regulation. Medical nurses have only ever been allowed subtle skin tone make up and surgical nurses none. No bright red lipstick, eyeliner, or mascara. In the very beginning of the movie there are news reels shown dating 1939-1940. In one of them an M-26 Pershing for a couple of seconds, however the M-26 Pershing wasn’t introduced until early 1945. Also in the scene by the Queen Mary, the Queen Mary wears her customary red and black paint. However, during the war she received a gray coat for “camouflage”. She received that in 1939. The movie takes place in ’41. And lastly, to give an idea of Japan, there is at one point a shot of three geishas. However geisha communities were shut down in 1939 by the Japanese government. If I had the time, I would rip the RAF airfield and Operation Doolittle to shreds. Maybe another time.